Look! I have been experimenting with more colour combinations. I love the effect of putting green with other dark colours - it seems natural and dramatic. 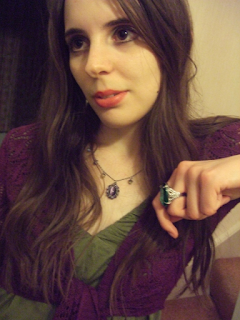 I wanted to dress like some kind of forest-dwelling princess today, with cats-eye makeup. Gala Darling posted today about Dressing With The Essence Of Fairytales, which is one of my favourite styles. I love crimped and wavy hair, floaty clothing, and you probably already know about my tiara obsession. The problem was that she had already posted yesterday about her latest Fashion Darling column for Cosmopolitan, in which the second secret of awesome eyeliner has finally been revealed (I've already written about the first secret). I had to combine the two. I went for gold eyeshadow and black liquid eyeliner, but then pressed emerald green eyeshadow (Bourjois' Noir Emeralde) on top of the eyeliner whilst it was still wet. I think I did a pretty good job! You can't see it very well here, hopefully there will be better pictures for tomorrow! Of course I've got to try it again! Katie Bair's Petting Zoo Wig Design: The most wonderful wigs I have ever seen. Some of them are in jawdroppingly amazing styles. I wonder how comfortable the most elaborate are to actually wear. The Most "Me" Item of Real Jewellery Ever: Silver! Amethyst! A key! Want! Need! Love! They are very striking together, aren't they? jess - thank you! I got it (and its 30-40 brothers and sisters in different colours) from the shop by the Pirates of the Carribean ride in Disney World. You got to fill a plastic skull for $12.99 so we filled it up with rings. I'm afraid I don't know where else you can get rings exactly like that. Big rings aren't too difficult to find though, and I'm going to do a blog post soon with a round-up of the best! What Is Wrong With Darning One's Socks?